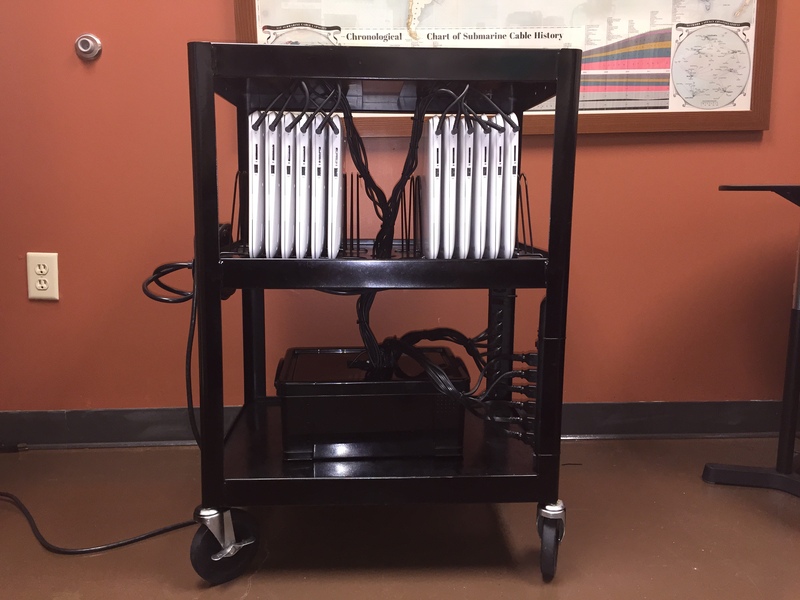 We decided to roll out a Chromebook cart this year to use in the 3rd to 5th grade classrooms. The choice to go with Chromebooks was surprisingly easy once I actually tested a unit out for a week. I had already decided to migrate the students over to the Google Apps environment, which is what the Chromebooks are designed for, and there just wasn’t anything comparable in the price range. The difficult part was the cart. I’ve seen a number of carts, and they are all pricey and over-designed for our needs. We needed something very mobile, since I envisioned the kids moving it around. We needed something compact, since it would live in my small office. And, we needed something that made a statement about our school. Okay, maybe we didn’t really NEED that last part, but I saw an opportunity. We didn’t need the security built-in to most of the options out there, and we didn’t need the power management that many of them have. So we brainstormed. We have a great team here! Ideas came in from all areas. We finally settled on this design, which consisted of an old underused media cart, a couple of wire file organizers, a couple of power strips, and a plastic box to hide the cables. Our Director of Operations spent many hours sanding and painting, and adding a big hole to the middle shelf of the cart and small holes for the feet of the wire folder organizers. I epoxied a couple of cabinet handles to the bottom of the top shelf for wire management, and tied the cables up in attractive bundles. Altogether, we paid less than $60, put in a few hours of work, and ended up with a solution that I think I actually prefer to the carts I’ve priced at $1500 or more! There’s a reason Resourcefulness is part of our school’s motto! where did you guys get the vertical organizers? They are just vertical file folder stands, from an office supply store. I find they are a little too narrow for standard laptops, but fit the Chromebooks very well. If I were to do it again, I would probably use the chrome finished ones rather than black. The Chromebooks have a pretty white finish that is now marred with black streaks from the stands. Also, we tried taping the bottom of some of the file folder stands to provide cushioning for the Chromebooks. I can’t tell that it has made any difference. We love the stand and we are going to try and recreate it for our elementary! Thanks for the great ideas!